A Minneapolis based Essential Oil Company with therapeutic grade single notes, blends, essential oil perfumes and other purposeful products. 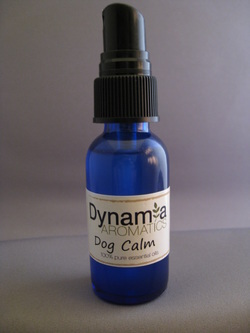 Dog Calm is a blend of expertly sourced 100% Pure Essential Oils, ( Roman & German Chamomile, Australian Lavender, Spanish Marjoram, Orange Flower Hydrosol, & Bach Flower Essences of White Chestnut, Rock Rose & Rescue Remedy) All tested 100% on Humans first- safe to use on dogs, on their dog bed, in their crates/kennels. White Chestnut is the Bach remedy for repeat-chain thinking or behaviors, so that helps with dogs that do whacky things, or obsess. Rock Rose is for general shock and needing to be calm, and Rescue Remedy is for all things needed to be calm. Diluted in water, no preservatives, or any other chemicals. 1oz $18 - please visit the Shop page to purchase it.